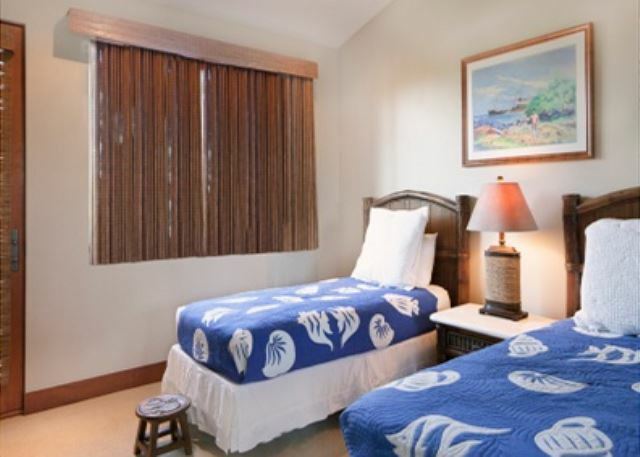 The House of Tranquility offers a ample space for any family and offers expansive beach and ocean views. 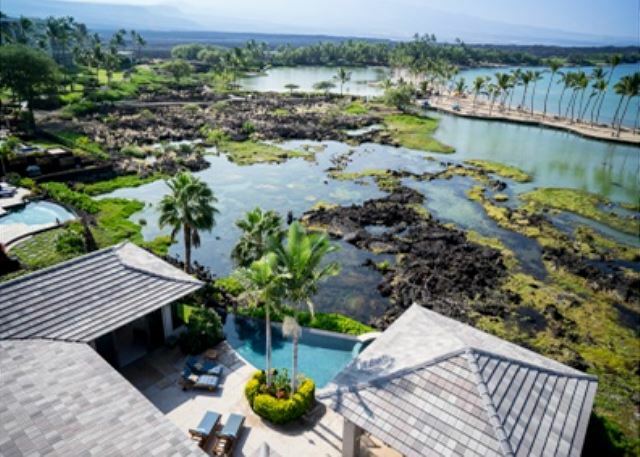 Situated on the beautiful ancient ponds of Waikoloa, the House of Tranquility offers a spectacular view out over the ponds of the white sand beach and A'Bay. 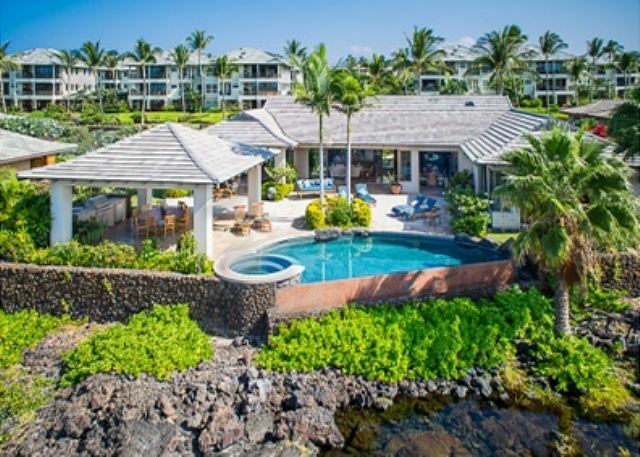 This 5 bedroom home offers easy access to the Kolea Beach Club, the beach, and the Waikoloa Beach Marriott. As you enter the property you will be astonished at the well manicured landscaping and the entry pond as you walk over it to enter the home. 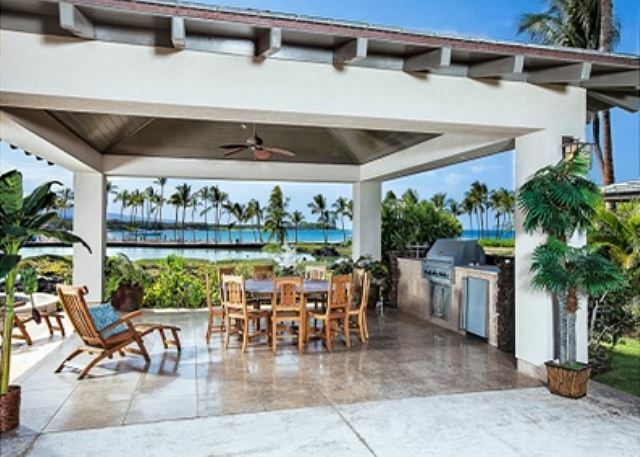 Through the front doors is the spacious great room overlooking the expansive lanai and beautiful view. 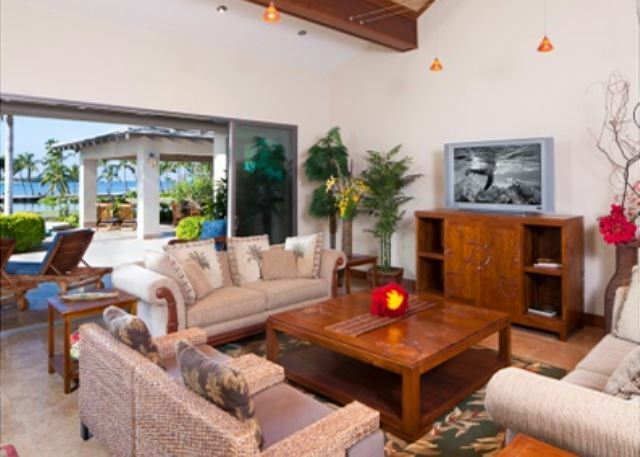 The living room has two large couches with two chairs centered around a large coffee table and facing a LCD television with a DVD player and extended cable. 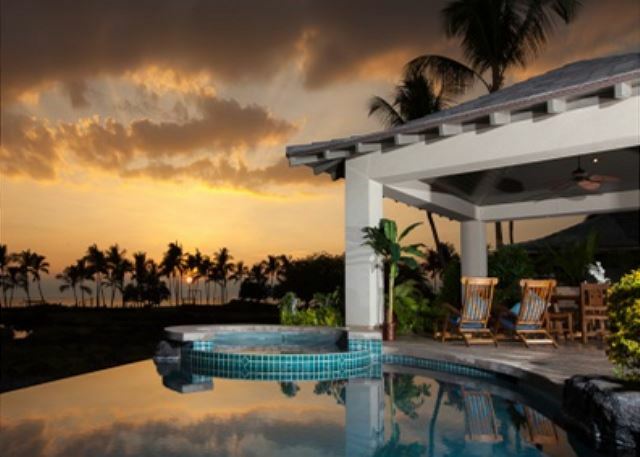 The large doors open up to the lanai. 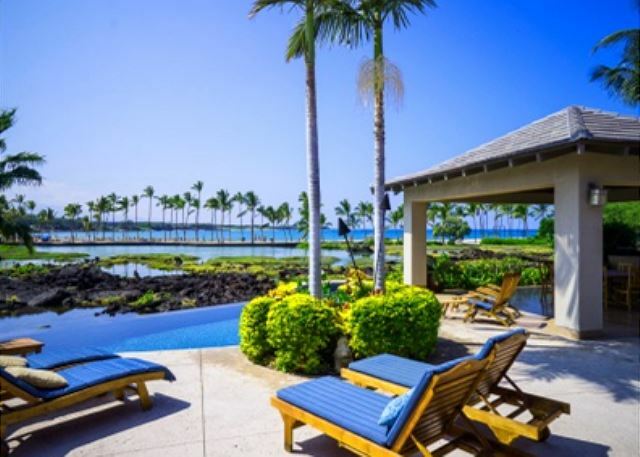 Located here is a nice lounging area with a day bed and four lounge chairs. Just steps from this is the nice infinity pool with a jacuzzi. There also is a nice covered dining area with seating for 9 and two additional chairs with a stainless steel grill and refrigerator. 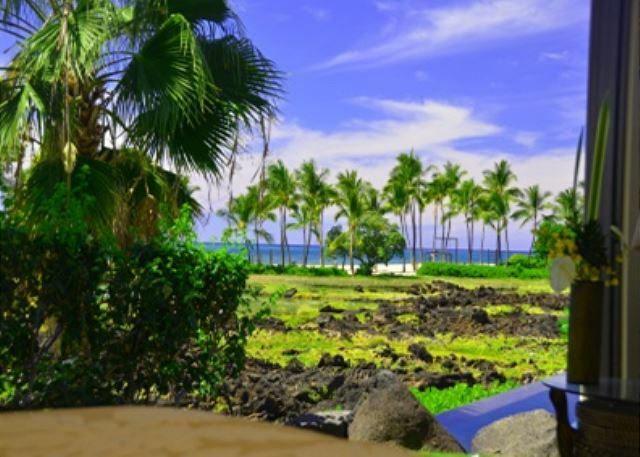 All of the area overlooks the ocean and beach. Adjacent to the living room is the dining area and kitchen. 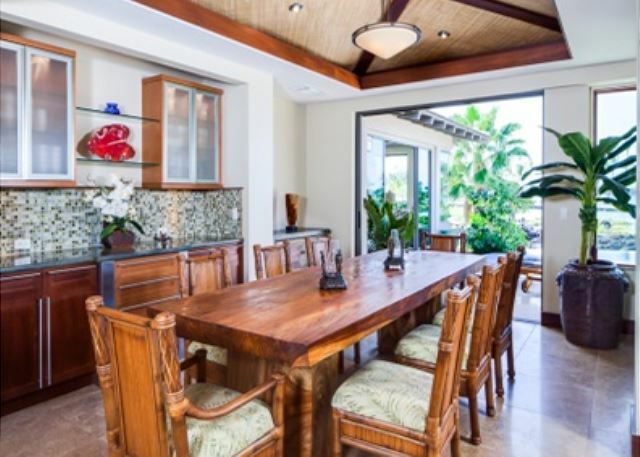 The dining area has a beautiful wood table with chairs that seats 10. The kitchen is fully stocked and features stainless steel appliances and granite counters. 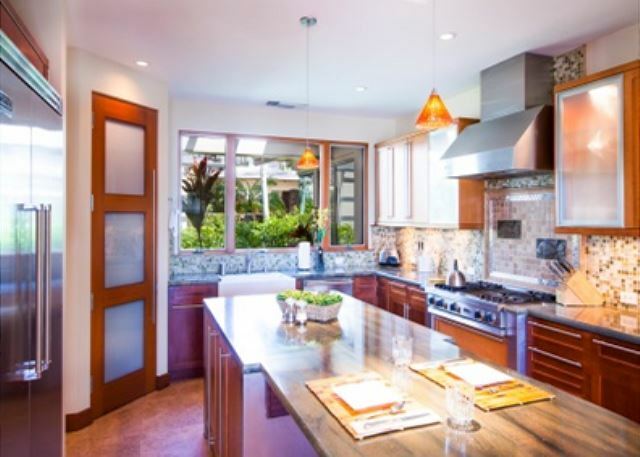 Amenities of the kitchen include a spice rack, dual ovens, a microwave, a side by side refrigerator/freezer, a gas stovetop, and an array of small appliances. 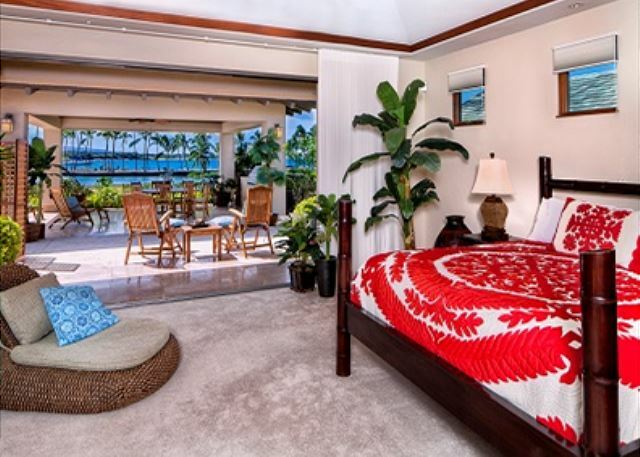 On one side of the home is the spacious master bedroom. Located here is a king size bed with bedside tables and a wall mounted LCD television with a DVD player and extended cable. The large wraparound doors open up to the pool and beautiful view. Also located here is a chest of drawers and a large walk in closet. The attached bathroom has a deep soaking jacuzzi tub, walk in shower that opens up to an outdoor shower, and dual vanities. Also on this side of the house are two guest bedroom. 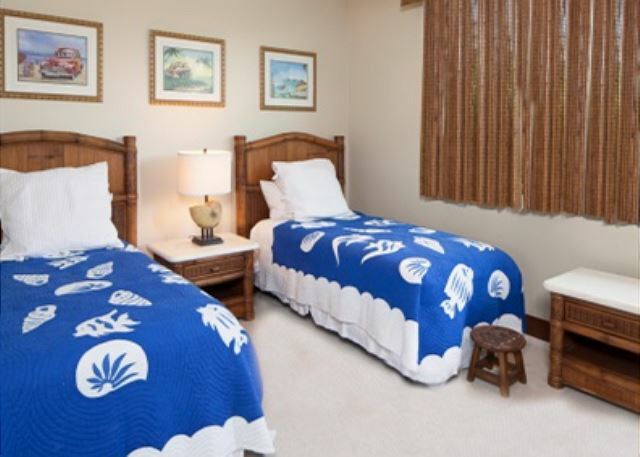 One guest bedroom has two twin beds with bedside tables that can be converted to a king size bed upon request. There is also a LCD television with a DVD player and extended cable. The attached bath has a tub/shower combo with a vanity. The other guest bedroom has the same configuration, which can also be converted to a king and also has a nice chair for lounging. The attached bathroom has a walk in shower with a vanity. On the other side of the house is the second master bedroom with a king size bed facing an armoire encasing a LCD television with a DVD player and extended cable. 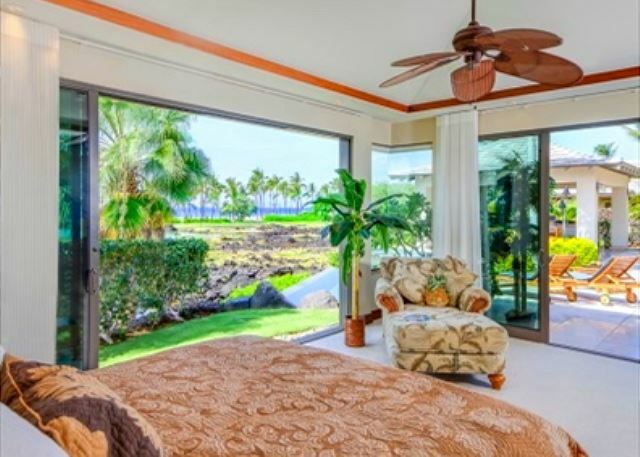 The large doors open up to the lanai and beautiful view. Also located here is a nice chair for lounging and a futon. Walking into the master bathroom you will pass a large walk in closet. The master bathroom has dual vanities with a large jacuzzi tub and a walk in shower that opens up to an outdoor shower. 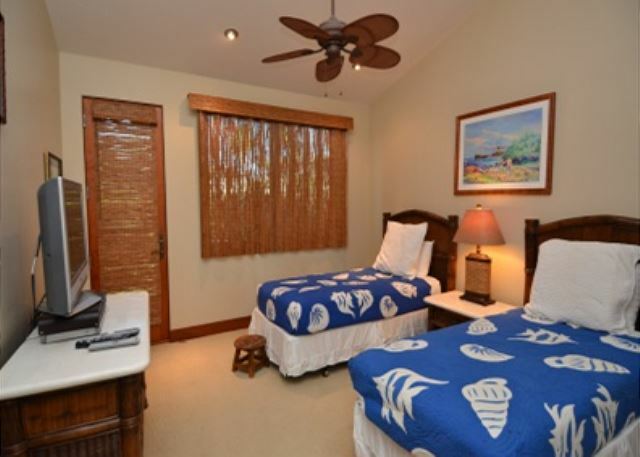 Also on this side of the house is another guest bedroom with two twin beds that can be converted to a king size bed upon request with bedside tables. There is also a LCD television with a DVD player and extended cable and dresser. The attached bathroom has a vanity with a walk in shower. Other amenities include multi zone air conditioning for ultimate comfort, a two car garage with an additional refrigerator/freezer, and a laundry room including a full size washer and dryer. Guests of this home get access to a private concierge. The concierge will greet you upon arrival and make sure every aspect of your stay is perfect! Pre arrival grocery shopping as well as a lei greeting are just a few of the many services available to you at this private estate at Kolea. 5/5 stars Review by E.
The reception with the rental agency was excellent. We were very happy with the size of the house, the layout, the pool and barbecue area were great, the bedrooms were very suitable for our needs and all of the facilities in the house were great. We had to call the agency a couple of times and the response was excellent. We would certainly recommend the house to our friends.You can display my name Ron Emerson alongside my review.